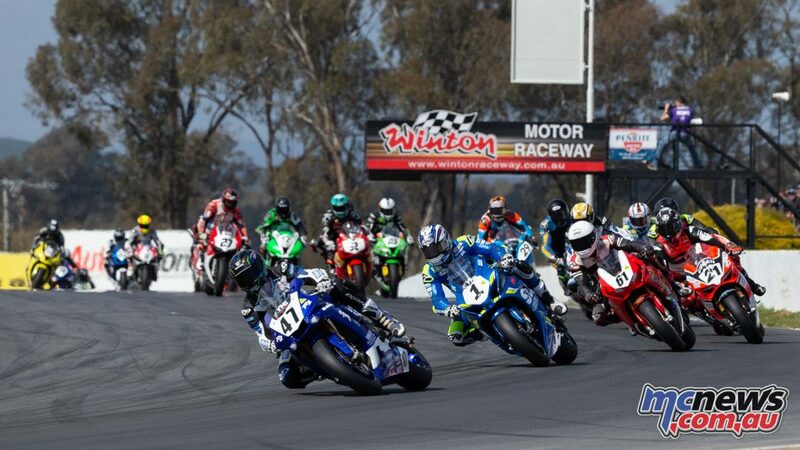 Things could have hardly worked out better for Troy Herfoss in the opening 16-lap Superbike bout this morning at Winton Motor Raceway. 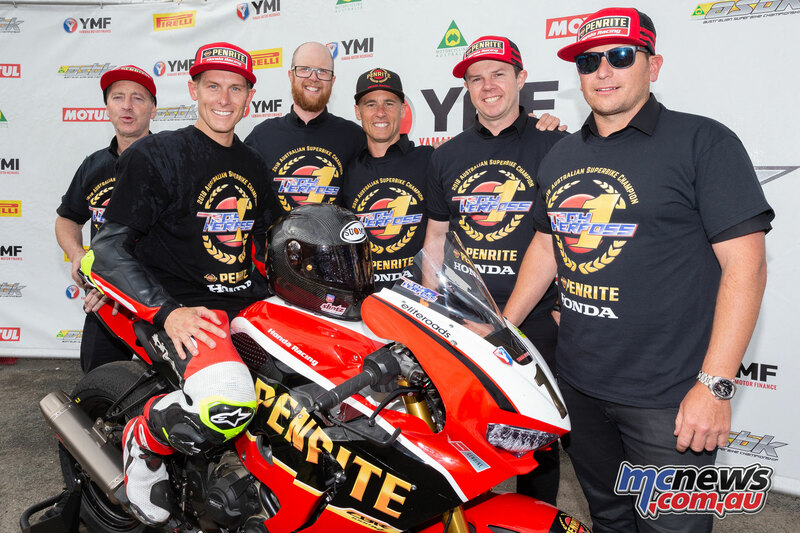 His prime rival for the 2018 ASBK Championship Title had gone down and scored no points, while the Penrite Honda man had added another 25-points to his tally to enter this second race with a massive 70.5-point buffer over Maxwell and Bayliss. 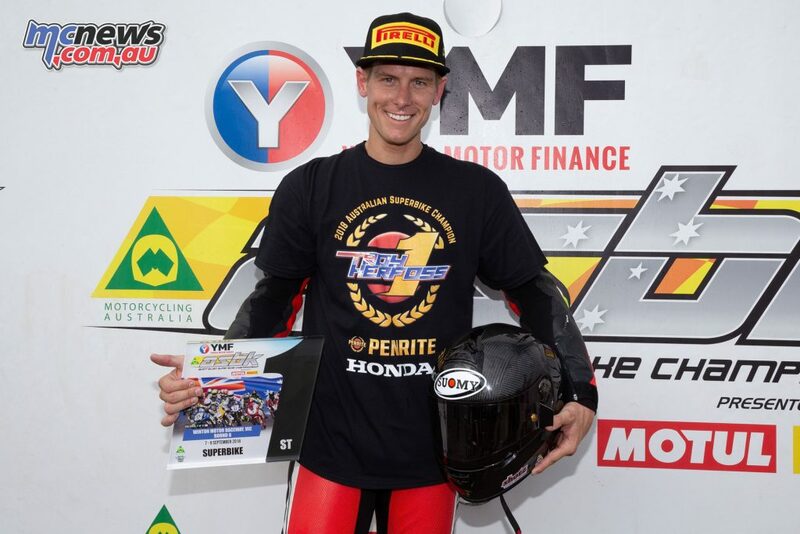 Thus if Herfoss scored five more points in this battle, then the 2018 war would be his, and he would be crowned ASBK Champion a round early. It didn’t take long, Maxwell up the inside at the almost 200 km/h left hander before the esses to take the race lead on lap two. Later on that same lap Bayliss then pushed Herfoss back to third place, along with Josh Waters the leading group numbered four riders. Behind them a bit of a melee at turn one on the opening lap had seen three riders run off the circuit. Daniel Falzon, Mark Chiodo and Jamie Stauffer all with plenty of work left to do in order to climb their way back up the ranks. The red flag then came out to put a halt to the race. Jamie Stauffer went down at the esses, then Chiodo also went down. The airbags were damaged in one of those incidents which caused officials to halt proceedings. 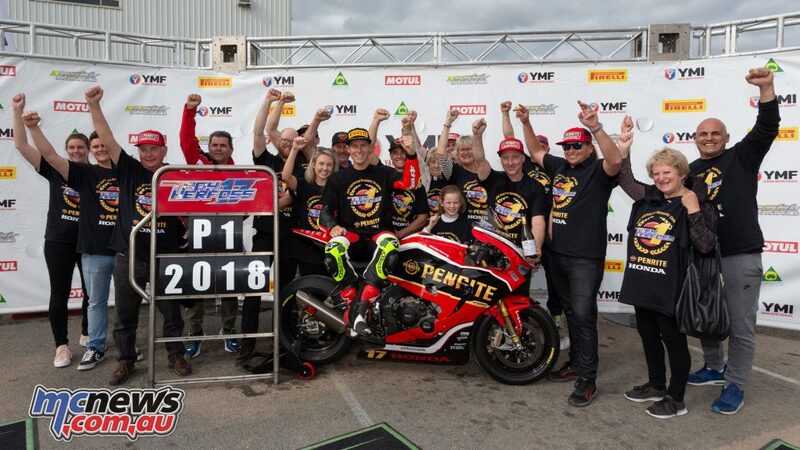 Teams rushed out on to the grid to get the tyre warmers back on the Superbikes as they waited for the re-start as they desperately tried to prevent the tyre cooling down and entering a heat cycle that would then change the characteristics of the rubber. That is almost unavoidable with the lengthy delay to reinflate the circuit protection barriers, and with tyre wear and longevity absolutely crucial as always, how each riders tyres individually respond to that cycling could essentially decide the result of this race. Wayne Maxwell led the field through turn one while Arthur Sissis again showed his awesome clutch hand to catapult forwards to second place. Bayliss quickly went through to second place, followed by Herfoss and Waters. 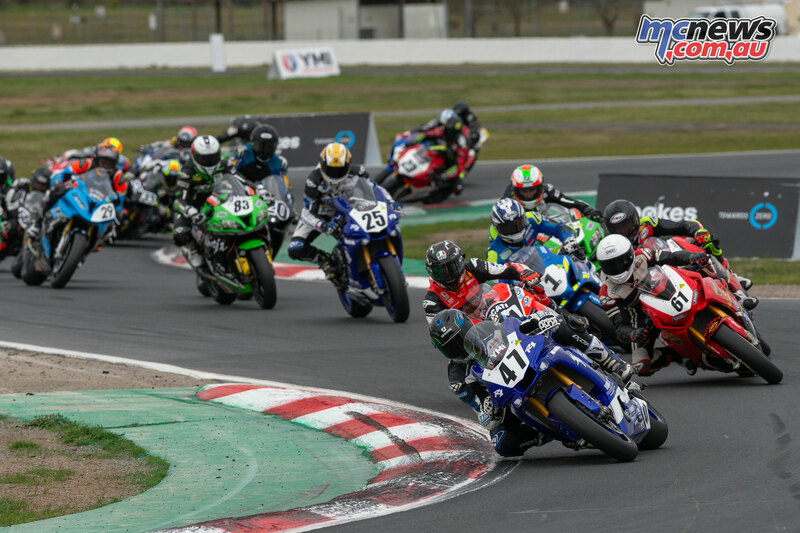 The riders had not made it around that opening lap before the red flag came out to halt proceedings once again. Nathan Spiteri had gone down fairly hard at the esses and required medical attention. Team personnel then again mustered their generators and tyre warmers on to their charges. 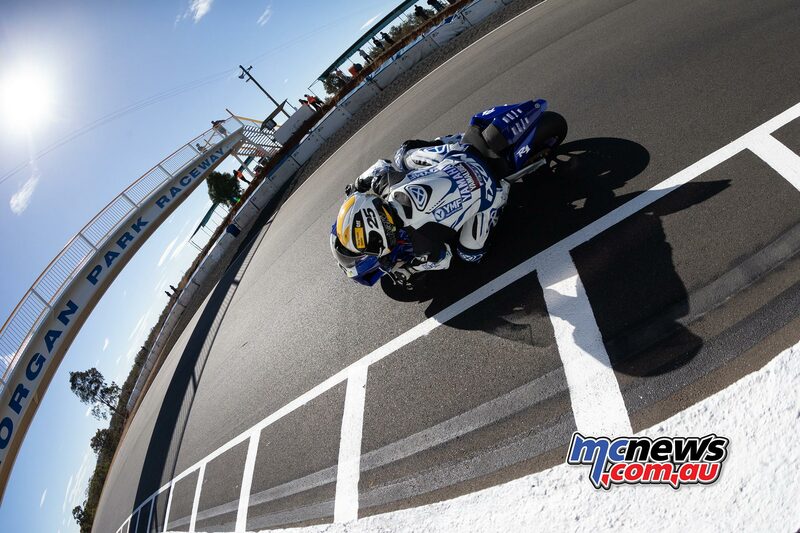 Meanwhile the riders had to settle their minds and again prepare for another start. There would also have been some conjecture as to whether they actually would start again. At the back of some people’s minds would have been a rule mandating that any race stopped twice would then be cancelled from the programme. Obviously that rule was not in the 2018 regulations though as officials declared that we would start again for another attempt, this time a reduced 12-lap distance. Herfoss got off the line better this time but Bayliss had warp speed engaged on the Ducati to shoot to the front up the inside at turn one ahead of Maxwell, Waters and Staring while Herfoss has been shuffled back to fifth place through the esses as he concentrated on keeping his nose clean. Herfoss passed Staring late on lap one to move back up to fourth. At the end of the opening lap Bayliss led Maxwell and Waters across the stripe while Herfoss was 1.8-seconds behind in fourth. 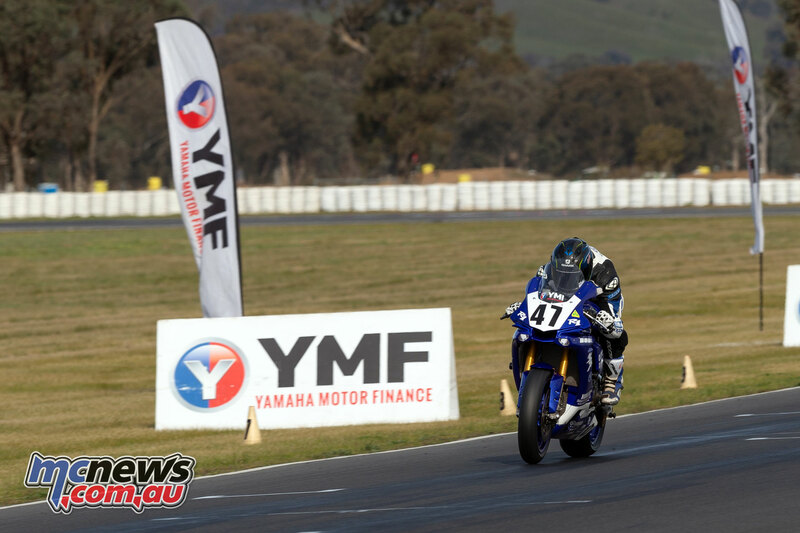 Staring started to come under attack from Daniel Falzon and Arthur Sissis on lap two while Maxwell slotted his YRT machine past Bayliss to take the race lead and then dropped in a 1m20.4 to pull away a little from Bayliss and Waters. 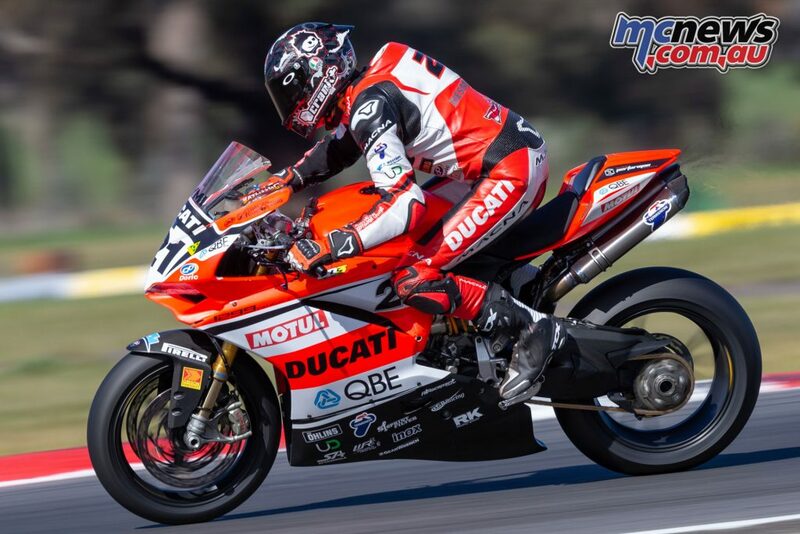 Maxwell continued to rule proceedings at the front but Josh Waters was all over Troy Bayliss and getting somewhat frustrated in trying to get past the Ducati. 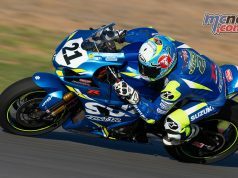 He was making thrusts on the Suzuki but Bayliss would parry and make Waters pull out of the move, but it seemed as though it would only be a matter of time. 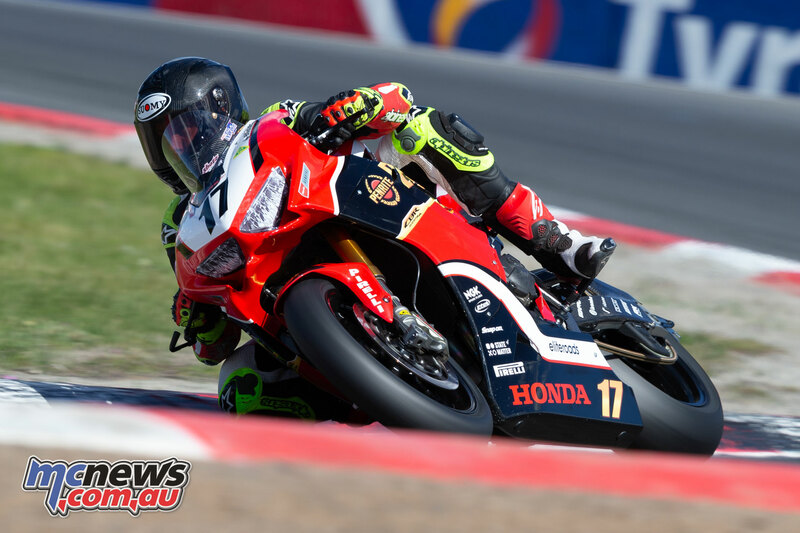 Waters finally got Bayliss with 2.5 laps to run, and the #1 Suzuki then immediately pulled away from the three-time World Superbike Champion. 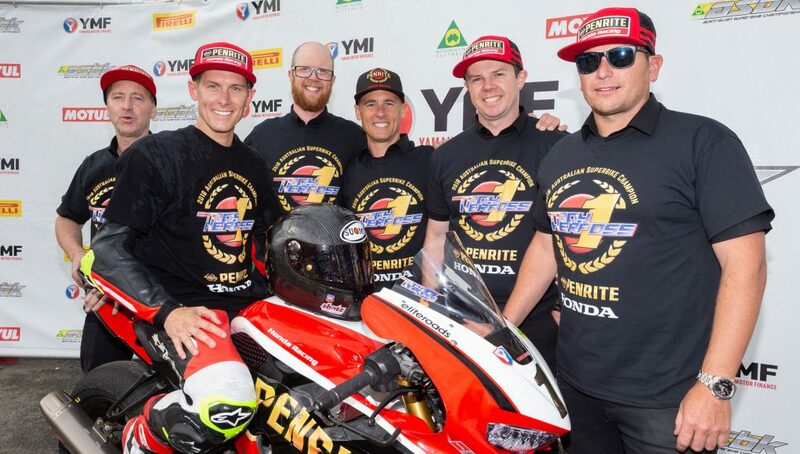 Herfoss was then on the back of Bayliss, but Herf’ then gave the Penrite Honda squad back in pit-lane heart palpitations when he made a mistake and almost ran off the circuit. 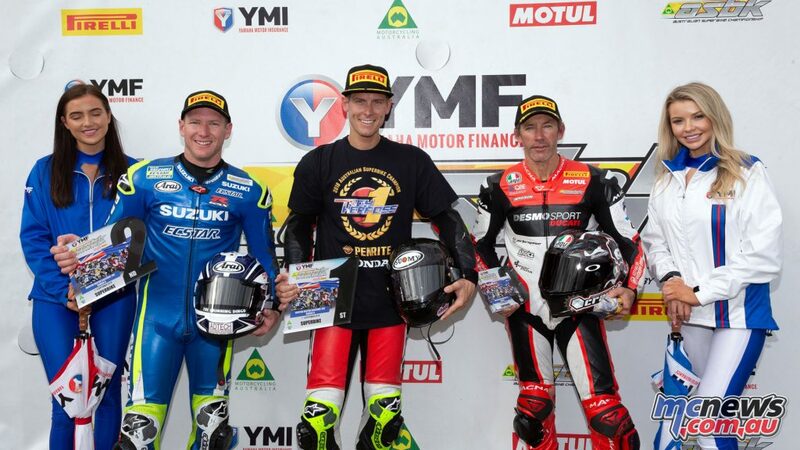 Herfoss made no rush of getting his act back together which allowed Staring to sneak past him while Daniel Falzon also looked likely to challenge the Penrite Honda man on the final lap. It would not matter if the South Australian did, as Herfoss would still be crowned champion. Wayne Maxwell takes a dominant race victory ahead of Josh Waters and Troy Bayliss, but it is Troy Herfoss that with fifth place lifts the 2018 ASBK Championship trophy. That fifth place in the second race was also enough to earn Herfoss the round win, but it was of course the championship he was concerned with. In parc ferme Herfoss revealed that in the race he lost quick shifter and traction control and just wanted to bring it home old school way, but that things would come back intermittently and cause him some headaches. With that in mind he did well to keep it together and bring the show home for championship victory, while the round win was just a surprise bonus. While the championship has now been decided, we still have another round remaining to decide who will take the #2 plate. Heading to that October 14 Phillip Island finale, Maxwell has a seven-point buffer over Bayliss but Josh Waters is right in that hunt too. Daniel Falzon is still an outside chance for that #2 plate too should he rise to the fore at Phillip Island.